SAN FRANCISCO -- Brandon Belt was a homer short of the cycle and drove in five runs, Hunter Pence drove in a pair on three hits and the San Francisco Giants completed a three-game sweep by beating the San Diego Padres 13-9 on Wednesday. 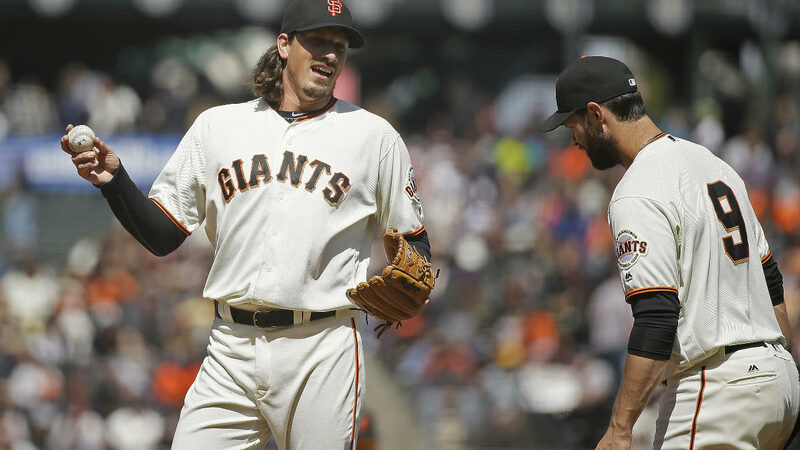 Samardzija won despite allowing a season-high five runs on five hits. He walked two and struck out a season-best seven. Padres starter Andrew Cashner (1-2) couldn't get out of the third inning, giving up six runs - three earned - on four hits over 2 2/3 innings. He walked four and struck out a pair. Wil Myers hit a three-run homer and extended his hitting streak to 12 games to match a career high. Matt Kemp homered and drove in two runs for the Padres, who lost their fifth straight. Kemp had 10 RBIs in his first five games but just three over his previous 15. Adam Rosales also hit one out, Jemile Weeks tripled in a run and Brett Wallace had a run-scoring double. Alexei Ramirez added a pair of hits. The teams combined for three homers, four triples, three doubles and 15 singles. Cashner, who also drove in a run, turned in his shortest outing since a two-inning stint at the Washington Nationals on July 5, 2013, and the Padres lost for the 12th time in their past 14 games in San Francisco.